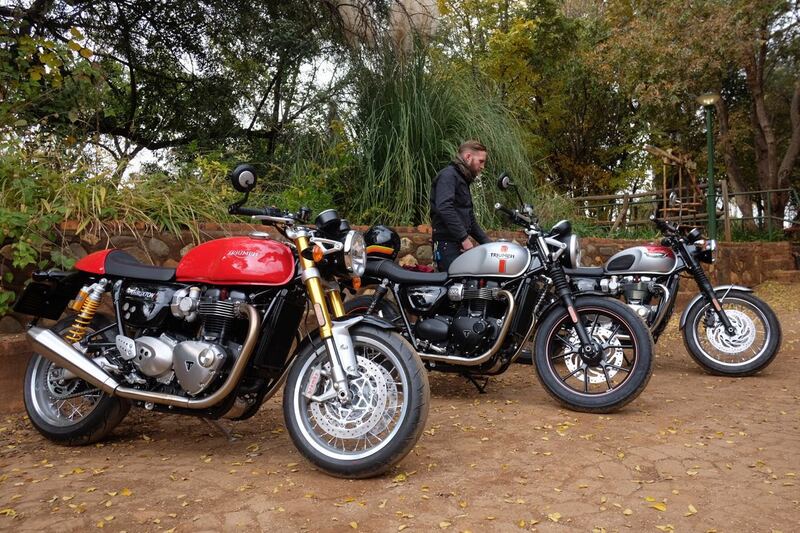 Last weekend I had the opportunity to test ride three of Triumph’s latest models. Of all the new motorcycle models currently being released, these are the ones that I was most interested in riding. I am presently riding my second Triumph Bonneville T100 and I have done close to a 100 000km’s between the two of them. 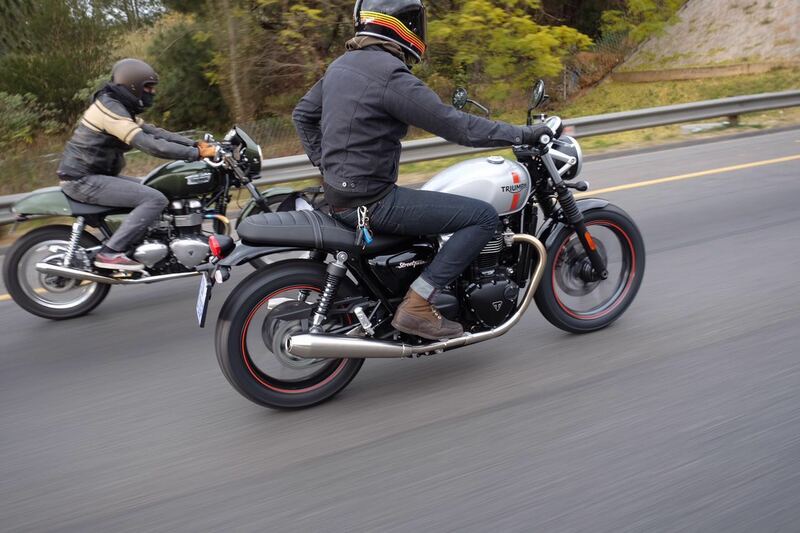 So how does the old Bonneville/Thruxton compare with the latest (Speed twin/Bonneville/ Thruxton R) generation? Straight off the bat all three models are have much improved stopping power, performance, comfort and handling. The 270deg crank (vs old 360deg) offers more bottom end torque, awesome V-twinish sound and less vibration. The fly by wire (electric non mechanical throttle) makes all three models more responsive. The Traction control and ABS will give the unexperienced rider much more confidence. I really admire how Triumph tried to tie the old in with the new. For the classic Triumph experts, you will notice that many styling cues were taken from the old unit-construction Triumph. On the Timing cover for example, you will see a similar Timing inspection/adjustment cover. The new throttle bodies look like old Amal Monobloc carbs. The rear wheel’s hub looks like the later models conical hub. Even the primary cover looks identical to its classic sibling. For me personally the Speed Twin (900) makes more sense than the Bonneville T120 (1200). If you are into classic styling the Bonneville is definitely the one for you. Other than that there is not really much of a riding difference between the Speed Twin and Bonneville except for an extra bit of hardly noticeable torque. At the higher end of the price range you will find the Thruxton R. What’s the difference between the Thruxton R (1200) and Bonneville (1200)? The Thruxton has got lighter internals and what Triumph calls a high output motor. So in other words, it revs much faster and has more horsepower. Other than that it has adjustable suspension(Showa upside down forks and Ohlins at the rear), Brembo brakes, wider rim and tire at the back and smaller rim in the front to improve handling. An aluminium swing arm saves weight and it has a more aggressive seating position. I chose to only test the Thruxton R. I have always been fond of the previous generation Triumph retro twins, especially the Thruxton, . 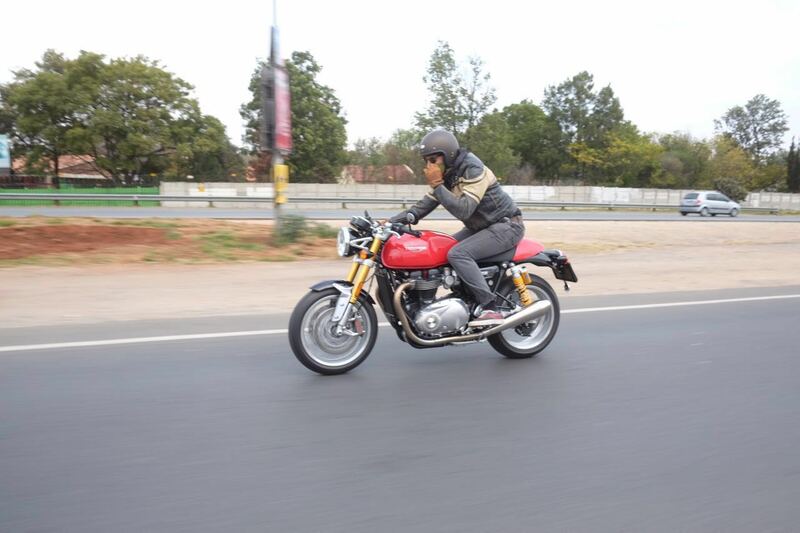 My wife Lara recently had a test ride on the new watercooled 1200cc Thruxton R around the brand new Kyalami racetrack at the recent motorcycle expo held there. She cannot stop raving about how much the performance has improved in all areas compared to the previous 900cc Thruxton. Based on her enthusiasm, I had great expectations when I rode the brand new demo model out of Triumph Centurion’s parking area. Oh what joy! This has to be one of the best motorcycles I have ever ridden. The previous model had great looks and adequate performance for the type of motorcycle and rider market at which it was aimed. In comparison to the performance of a modern sports motorcycle, the 900cc Thruxton’s performance was however mundane. The new model will satisfy a far greater, more performance hungry section of the market. For all the reasons mentioned by Marnitz, the new Thruxton R is a wolf in wolf&#39;s clothing. As a true retro motorcycle the 900cc version will always have a place in Lara’s and my heart. The all new Thruxton R will hopefully have a place in our garage. These photos were taken by the talented Richard Harper. Richard is the owner of a previous generation Thruxton and just bought one of the first T120 Bonneville Black editions. These photos were taken at the Triumph Modern Classic and Cruiser run. Richard gave us permission to use his photos, we regret missing this event. Riders in these photos: Justin Waddington from Shocklogic, Alan Shenton, Richard Harper and Nick Davidson from Traditional Triumph.